This year the major catch of the Ugadi celebration in Moscow was a beautiful rendering of “Maa Telugu Talli” and other Andhra classics by the visiting “whistle wizard” from the Andhra Pradesh state K. Sivaprasad. March 23. Expats from these states living in Moscow celebrated their New Year day called Ugadi, a week later, on March 31, on the date of another religious holiday Sri Ramanavami, the birthday of Lord Rama revered by Hindus the world over. Following the tradition, Ugadi was celebrated at the Interclub hall of the People’s Friendship University of Russia, a melting pot of various cultural occasions and festivities. Indians are among the most frequent and welcome visitors at the place. The highlight of this year's Ugadi was a whistle music concert performed by the "whistle wizard" K.Sivaprasad in which songs from classical to Bollywood were rendered effortlessly starting with what could be considered as the official Song of Andhra Pradesh, "Maa Telugu Talli", revered by millions of Andhras all over the world. Honing his skills to perfection, the maestro created a niche for himself in the galaxy of enchanting musicians. For lovers of Indian music it was literally a feast. Song after song rendered by the maestro kept the excited audience spell-bound. Vedika, the platform organisation of expat Andhras living in Russia in general but mainly in Moscow, organises this event every year, their first venture taking place in 2005. 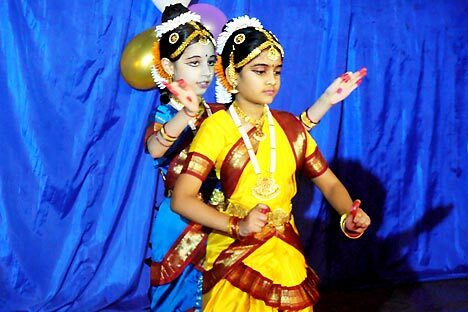 Young and budding artistes both Russian and Indian enthralled the audience with Indian dances and songs. The impressive Kuchipudi dance by Lekshmi Reghunath and Sveta Tulasi’s beautiful Khatak performance stole the viewers’ hearts evoking a storm of applause. 13-year-old Lekshmi conveyed a great range of emotions through her dancing despite her young age. And 20-year-old Sveta charmed the audience with her skilful performing of complicated dance figures. Children singing famous Andhra songs in an adorably shy and sweet way were also well received by the audience. After the event all the guests were served with authentic Andhra food which, in my opinion, was delicious, albeit a bit spicy, and, with many Andhra residents in Moscow knowing each other well, indulged in a cheerful chatter.